Crossroads Trade carries a wide range of exquisitely crafted textiles for the home, such as rugs from Peru and cushion covers from Palestine, South Africa and Bolivia. Among them are these: Peruvian Rugs: Crossroads Trade's Peruvian rugs are the result of door-to-door scouting in a Peruvian rug-weaving village. Most of the work you see here is by one weaver. Rugweaver Hernan's work is distinguished by the fineness of the thread. The high thread-count per inch is sturdier, and allows for greater detail and more subtle shading than is usually seen. The thread is handspun utilizing a drop spindle. Dyes are made from natural sources, including eucalyptus leaves, beans and cochinilla, a spider living on cactus. Palestinian Cushions: Embroidery is a rich tradition among Palestinian women. The designs, such as cypress or palm trees, corn ears or stars, are based on motifs brought by each woman from her region or village. These motifs have been adapted for contemporary uses. For example, you'll find designs from a bride's handkerchief or chest panel from a traditional dress on cushion covers, table runners and purses. 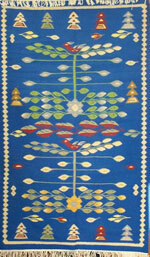 Crossroads Trade's Palestinian embroidery is bought directly from a women's employment project in several refugee camps. Your purchase helps impoverished women support their families and practice their traditional arts amidst cultural disruption. Bolivian Cushions: Many of our Bolivian cushion covers are made of handspun sheep's wool. The dyes are natural. Many of the earth tones are derived from walnut leaves. All of the reds, burgundies, purples and orange are from cochinilla, a dye derived from a spider that lives on cactus. Mordants include lemons and iron. Other dyes include carrot tops, thola (a small bush that grows on the altiplano), tara-tara (a seed pod), as well as eucalyptus leaves and scotch broom. South African Cushions: Crossroads Trade's vibrant hand-embroidered, cotton cushion cover are made by Shangaan artisans in Limpopo Province, South Africa. The artisans, mostly women, participate in an economic development project, which was begun 18 years ago by a handful of artisans. Now, it provides employment for 1,000 people in rural areas.